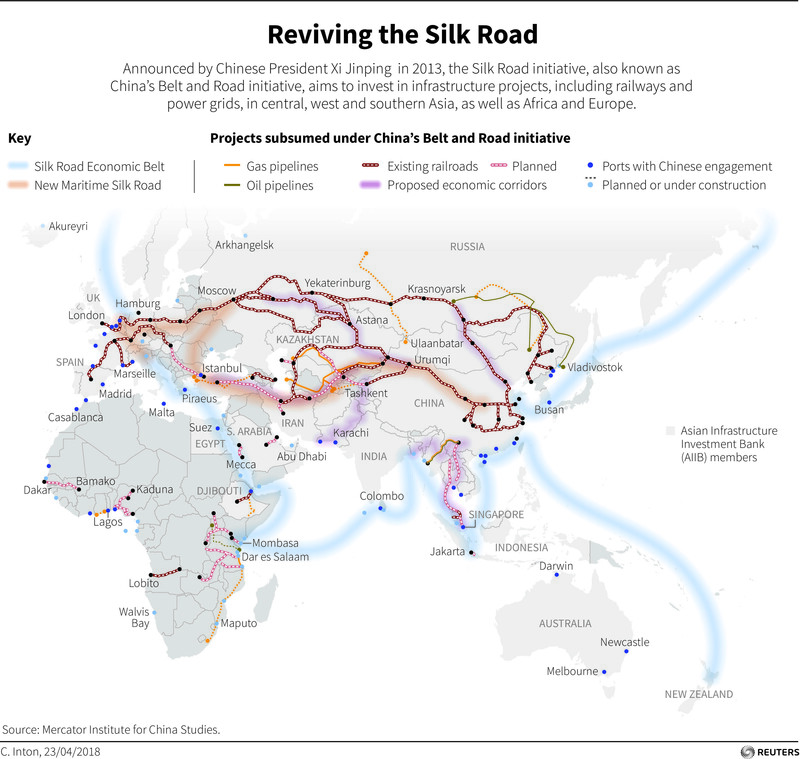 The Digital Silk Road could bring a green transformation to infrastructure. China’s Belt and Road Initiative (BRI) involves a trillion-dollar investment programme to enhance economic interconnectivity and facilitate development across Eurasia, East Africa and close to 100 partner countries. “Belt and Road” brings to mind a web of enormous physical infrastructures, such as roads, railways, energy pipelines and ports. Consequently, many people think the cross-border business on the BRI will be mostly related to the abundance of surplus industrial capacity in China, much of which is heavily polluting. As such, the sustainability of the BRI is much debated globally. What’s promising, however, is that new technologies are bringing a new digital dimension to it. In May 2017, speaking at the Opening Ceremony of The Belt and Road Forum for International Cooperation, President Xi Jinping of China brought cutting-edge technologies and the ongoing global Fourth Industrial Revolution to the BRI. “We should pursue innovation-driven development and intensify cooperation in frontier areas such as digital economy, artificial intelligence, nanotechnology and quantum computing, and advance the development of big data, cloud computing and smart cities so as to turn them into a digital silk road of the 21st century,” he said. China has rapidly transformed itself into a global power in the digital economy in recent years, both as the largest e-commerce market and a booming innovation centre of similar importance to Silicon Valley in the US. As such, the “Digital Silk Road” could potentially bring a green transformation to both infrastructure and economic models in emerging markets. Firstly, the Digital Silk Road will play a constructive role in making infrastructure development more viable, efficient and sustainable in the long run. For developing countries lacking critical infrastructures, it is highly valuable to build railroads and power plants. Adding new technologies, the Digital Silk Road will help make the new infrastructure the most competitive and efficient assets possible. For example, smart sensors and advanced monitoring systems can be integrated into infrastructure to ensure the optimization of resources. Smart grids provide a better way to match supply with demand so that power plants consume fewer fossil fuels. As an example, for the Jhang power plant in Pakistan, whose generation capacity equals the total power consumption of nearly 4 million Pakistani households, China Machinery Engineering Cooperation worked with Siemens to incorporate two high-efficiency gas turbines. Secondly, the Digital Silk Road will bring advanced IT infrastructure to the BRI countries, such as broadband networks, e-commerce hubs and smart cities. The upgraded IT infrastructure can transform their traditional businesses into digital ones and new growth sectors to scale – both will generate growth and jobs in fields away from polluting industries. For example, the mobile internet creates jobs in rural areas, turning farmers into online vendors. When new channels are created to transport farm produce to cities, every farmer can be an online merchant as the demand in cities for fresh, safe agricultural products grows rapidly. One rural entrepreneur only needs to have a 20㎡ space, buy a second-hand computer, and find a basic internet connection to become an online retailer. There are even villages with a majority of farmers working on Alibaba’s shopping site, Taobao - earning them the name of “Taobao villages”. A Taobao village is defined by Alibaba as “a village in which over 10% of households run online stores and village e-commerce revenues exceed 10 million RMB [roughly $1.6 million] per year.” According to Alibaba’s data, there are more than 1,000 Taobao villages in China. Thirdly, when more and more medium and small merchants are connected to global trading via digital networks, the Digital Silk Road can also support them with a smart cross-border logistics system. For example, every 11 November (known as Singles’ Day), China’s e-commerce companies host a 24-hour online shopping extravaganza. In 2017, the GMV (Gross Merchandise Value) exceeded $25 billion on Singles’ Day. It was also a global festival, as international buyers and sellers from more than 200 countries and regions got involved. No doubt, the global distribution of so many goods in such a short span of time created a logistical challenge. When it came to delivery, Alibaba’s logistics affiliate, Cainiao, used artificial intelligence (AI) and a GIS (Geographic Information System) to determine the fastest and most cost-effective delivery routes in a variety of complex road networks, including both rural villages and crowded urban areas. Cainiao used AI to predict what size box should be used to efficiently pack orders consisting of items of various sizes and weights. According to the company’s announcement, its solution reduced the use of packing materials by more than 10%. Going forward, in the global context, companies could all install digital warehouse and inventory management systems to save costs and resources on shipments. New digital technologies, such as low-cost satellites accessed by handheld smart devices, could provide real-time supply chain visibility to merchants so they know when a shipment will arrive and can plan operations in advance. This frictionless method of conducting business with a reduced focus on expanding physical infrastructures can enable more businesses and entrepreneurs to participate in global trade. Fourthly, the Digital Silk Road promotes sustainable development through the harnessing and application of big data to directly solve environmental challenges. For example, smart use of big data could enable African countries to better respond to water security issues, climate change and natural disasters. A body named the Digital Belt and Road has reportedly set up a $32 million programme, involving experts from 19 countries and seven international organizations, to tackle such challenges and also natural disaster risks and natural heritage protection. Finally, the Digital Silk Road is critically important for a sustainable global economy because it helps to address one of the most fundamental challenges of the Fourth Industrial Revolution: providing basic internet access for more than 3 billion people, roughly half the world’s population, who still have no internet connectivity. While the digital economy is booming globally, the failure to narrow the digital divide could slow socioeconomic mobility and harden differences between the world’s haves and have-nots. Through increased connectivity from the Digital Silk Road, emerging companies and markets will generate basic data from their businesses and operations, which, as it matures and gets structured, could become big data on, for example, their product supply and demand dynamics and the history of prices and their trends. By going digital, small and medium enterprises (SMEs) can make more agile adjustments to improve their operations, develop new services and upgrade their business models for greater success. Furthermore, the Digital Silk Road brings a larger cyber market to entrepreneurs in emerging markets – an integrated digital environment that is both larger and more robust than existing systems, allowing innovators to test and commercialize ideas that originated in small, isolated markets. With that, there is real hope that lagging economies can leapfrog many of the barriers that have held them back and head directly into the AI-powered digital economy. The Digital Silk Road’s time has truly arrived.